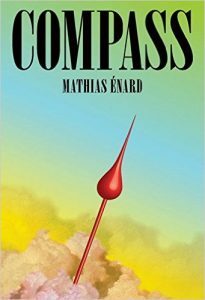 Compass is one of those novels that requires high levels of engagement, whose scope of knowledge is scintillating and baffling. Franz, the narrator, is seriously ill. Set in one sleepless night, we follow his thoughts as he contemplates his mortality and his failed loved life. He has had two obsessions in life: the workings of Oriental music within the European tradition – both Europeans using Oriental motifs or Oriental composers working in Europe – and Sarah. As he thinks back over the intensity of his times with Sarah, remembers visits to the desert and trips to strange museums like the Museum of Crime, he regrets the past, wonders what he means to her, and considers the possibility of telling her about his feelings and his illness. So far, not even his mother knows he is ill. He also debates the construction of Orientalism, as well as the construction of Western Europe, both fluctuating ideas requiring the nurture of East and West, commenting on the ways in which new extremism requires the neglect of history and tradition on both sides. He mocks the European desire to take ‘Oriental’ culture for its own, copying its instruments and sometimes literally digging it up and flying it home. In this way, it becomes part essay and has something of a feeling of Montaigne (though much more extended). The way academic argument and memory merge with dream and the present discomfort of the body, is impressive and at times overwhelming. This is not a novel you can read in idle moments. You need to give it your attention and then you are rewarded with total immersion into Franz’s head, a journey that crosses continents and states of consciousness with elegance and a bitter edge of regret for a life lived so fiercely in the mind rather than in action. He waits for an email from Sarah ‘a compass pointing always towards the inbox of my email’ and all of the churning thoughts of the night fade into longing with a dawn of hope that you will have to read to discover. In some ways, I feel like I need a few more degrees to coherently tackle Compass, but it’s a fascinating novel filled with stories and ideas I will definitely go back to. Next week, I’m reading Reconciliation by Guy Ware and I have five copies to giveaway. More details will follow with the review next week.